Mr Bedford and I sit together in the early morning in our hotel room in Eastbourne. The sun is shining, the seagulls are seagulling, and the fresh sea breeze blows in through the open windows of our room. We are here this weekend so that Mr B can play tennis. 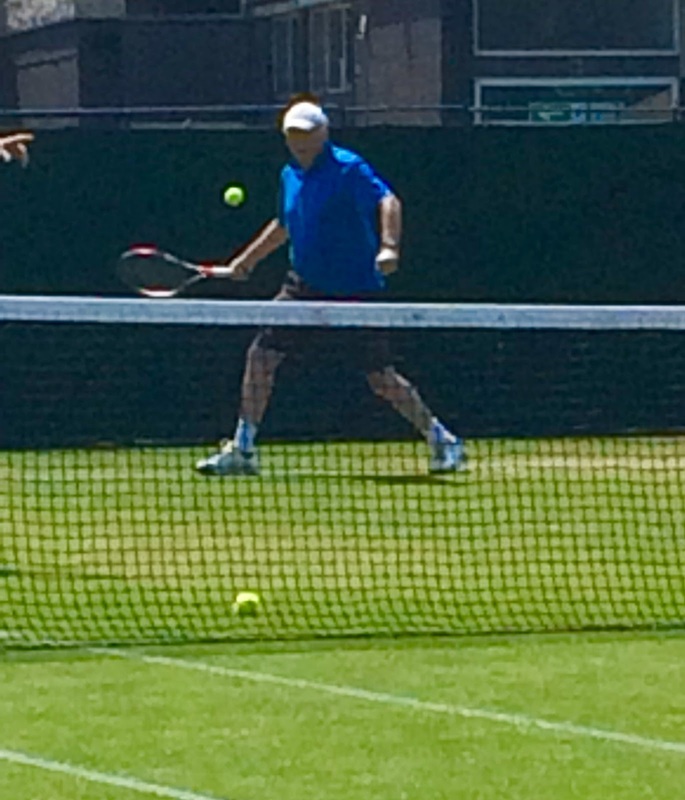 He has been an enthusiastic member of the Active Away Tennis Holidays for years now, playing abroad and playing in the UK, and loving every minute of it. 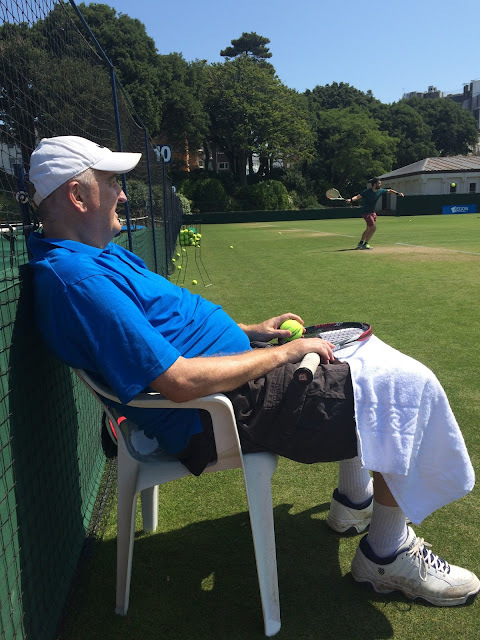 This particular short break is held on the grass courts at Devonshire Park in Eastbourne, and we have come here together so that he can play as much tennis as he can, and I can have a break and watch him play. The session has started on the courts opposite our hotel, and soon, we will go and join them. This is day two, yesterday Mr B played far more tennis than we expected, pushing against his illness, and causing the tennis coaches and teams to call him #inspirational. Mr B is wearing a bright blue shirt, and a white baseball cap making his 6'4" frame very visible. I am wearing a pretty halter neck summer dress, lots of sunscreen, and pink lipstick. The scene is set, our day will now begin. You get the picture. One of us who is very healthy will sit down a lot, and the other who is not well, will play tennis. Mr Bedford, Alan, is my other half. We have been together for most of the past eight years. He is tall, athletic, sports mad, clever, independent, driven, competitive. We are wonderful together, we are total opposites, and we drive each other batty too. 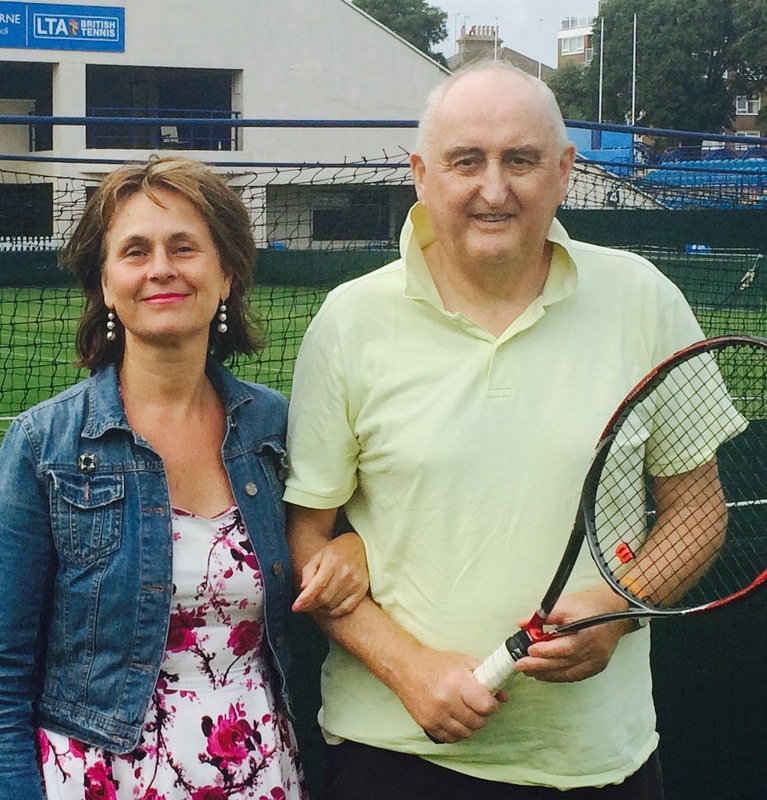 And so, over the last eighteen months, my competitive, focused, tennis mad, clever, kind Mr B began to suffer intermittent heart beat issues, though not enough to stop him winning tennis cups as recently as October 2015. As it got steadily worse, by early 2016 he began to suffer various aches and pains that were completely different. The GP didn't examine him, or refer him. 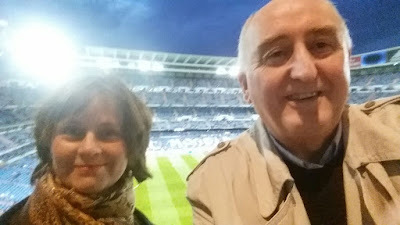 We went on a wonderful holiday in Madrid in March, where Alan agreed to come to the art galleries if I would come to a Real Madrid football match with him. It was fabulous, the art galleries were glorious and the football match - well, it was so exciting. Alan knew everything about the game and the staduim, I was delighted to note that not only was the big outdoor stadium well heated, but that the passionate, shouting, excitable fans all sat down at half time and took out foil wrapped sandwiches of salami and large white rolls of bread. I imagined their mothers packing proper snacks so that the wildly excitable fans would have a sensible food break before standing up and shouting again. Madrid was wonderful but it was noticeably hard for Alan to keep up with the walking. His energy was low, he was breathless, and despite the absolutely wonderful time we had, he didn't feel well. I didn't give it a second thought. Mr B is always fine, he is in control, he knows exactly what he is doing, he is Mr B! When I think back at how blase I was about his need to stop, to rest and to get his breath, I am horrified. At home, Alan's health got worse and worse. I was very sorry but carried on with my busy life. Nothing seemed to work, nothing was relieving Alan of his symptoms, and it seemed that things were getting serious. I was incredibly busy, but wasn't too worried about Alan, and hoped he would recover soon. He always knew what to do. I left Alan to sort himself out, thinking it was only a matter of time before all was well again. During all this, my brother Dominic was dying. He had been dealing with his cancer for over a year, and things were getting bad for him. My other brothers and I took our father up to see him in Edinburgh where he lived, and we all knew the end was coming. I am a soul midwife, I had arranged with Dom to come at the end to stay and to be there when he died. As I waited for the time to come for me to go up and stay with him, as Dominic's next of kin, I prepared for his dying, his death and what would happen afterwards. Late one night I arrived at the hospice in Edinburgh, slipped my hand into Dom's hand and stayed in his room with him until he died quietly and with grace three days later. On the day that he died, as I sat with the nurse going over the death certificate, a call from Alan came through. He had been to see a different doctor who immediately referred him and within a few hours, he had had a terminal diagnosis of cancer with secondaries. I am, said Alan on that phone call, stuffed. Immediately after this call my phone rang again and a man's voice asked if I had any spaces to do some Reiki for him. He wasn't feeling very good and he'd heard that Reiki was effective. I took his name and number and said I'd call him back. I hoped he'd think I was busy doing Reiki and much in demand, I hoped he didn't suspect I was sitting next to the dead body of my brother and trying to process the news that my partner, who's health and presence I had utterly taken for granted, had just been given his own terminal diagnosis. I did call him back, but I am not sure the Reiki he eventually received was any good. My dear, strong, wonderful Alan has the same cancer that Dominic had. The same cancer that Steve had. Each time this happens, it is as if it is the first time. Each person it happens to, it is the first time. Of course he is having treatment, and of course he is fully in control. We have time, we have some time, and while we all, his family, his friends, me, him, all get our heads around this, life goes on. Alan has said that he wants a good life now, within his cancer and the chemo, and that he has lost the need to be driven. That is true, Alan is much sweeter and it moves me that he is amazed that people are so kind to him. Of course they are. He is noticing now how much people like and love him, work and competitive sport are no longer in the way. But he is very weary and without his medication, can be in much pain. His son and I take it in turns to accompany him to his chemo every two weeks, and we, his son and I, consider it a great pleasure to spend this time with him there. It is the equivalent of down time with Mr B, which in the past, would not have been easy to do. Work, deadlines, action, sport, doing things, getting on were what motivated Alan once. Now, paradoxically, an afternoon having chemo means we all get to chill with him, chat, read papers, sit around, and eat sandwiches. And he is amused at how this has turned out too. Up and down, thank you for asking. Mr B is philosophical, practical and realistic. We take our lead from him. But I get such sad moments and have decided to live as much as I can, as he is doing, in the present. We are having such lovely times together, but I get lonely in advance. Then I shake myself out of it and think, lucky me, I still have Mr B today and right now, so let's get on with enjoying that. Mr B's illness has made me stop and take my own health into account. I tend to ignore my own body and mind, I think I am too busy and important to stop and smell the roses in my garden. I'll be fine, I say, don't ask me. I'm busy. I am trying to do what Dominic did, listen to my body and really hear it. I am trying to take stock of myself. And the funny thing is, sometimes I don't feel right, and sometimes I do feel ill, and that is fine. The world doesn't stop, and if I tell people, they are nice and no one thinks I am weak and making it all up. I am in the middle of this experience with Alan, and I have to accept that all I need to do, is to say how I am feeling right now. I have no idea how it will end, where it will end, and what will happen. But I do know that today is a good day, and there are more good days planned. It is now lunch time. Alan has come back from playing tennis, happy, sweating and tired. We order room service and he has a bath. He asks me what I have said in this blog, and I begin to read it to him but it makes me cry, and have to stop a few times. He holds my hand and listens, and then being Mr Bedford, suggests some improvements. I make them. We sit on our bed eating sandwiches, watching the Grand Prix racing. Alan knows all about racing too. He needs rest now, as he will be back on the courts playing in a couple of hours. As the oldest man on this tennis holiday at 67, with three different health issues (cancer, heart irregularities and lung clots), he's doing well. He didn't expect to get on court at all. But here we have the essence of Mr B. Determination, spirit, and rising to the challenge. We go home tomorrow, and back to chemo on Wednesday. I will take Alan this week. We will take our sandwiches in with us, and sit together amongst the drips and tubes and bleeps of the machines, alongside the other patients in the unit, and smile as we plan our next trip away.